On April 15, at 18:54 information was received to “911” service that a car accident had occurred on Kirants-Voskepar roadway: there were casualties, the rescuers’ help was needed. It turned out that “Nissan Teana” (driver V. E.) and “Mercedes E200” (driver S. K. born in 1984) cars had collided. 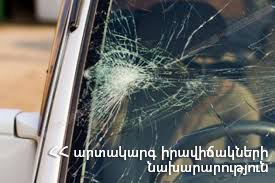 Before the rescuers arrived at the scene the passengers (A. K. born in 1986, V. E. born in 1987) of “Mercedes E200” had been taken to the medical center of Ijevan town by local forces. The driver and the other passengers (A. Ts. born in 1979, H. Q. born in 1962) and the passenger (G. Gh. born in 1950) of "Nissan Teana" car were hospitalized to the medical center of Noyemberyan town. According to doctors the casualties were in fair condition. The rescuers removed the cars from the roadway and loaded to the tow truck.